Everyone has a unique experience when it comes to finding their familiar spirit. I remember the first time I had an encounter with my familiar Buzz. It was a few years back and I was working in the store. 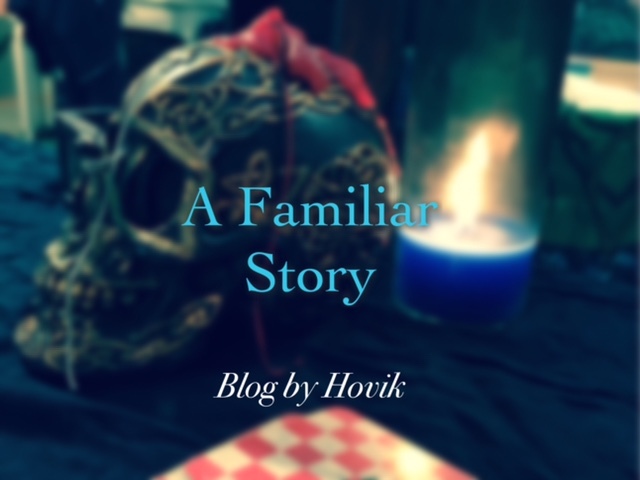 The idea of a working partner was not foreign to me and so when that day I saw the little blue goldstone skull in the case I felt a connection. 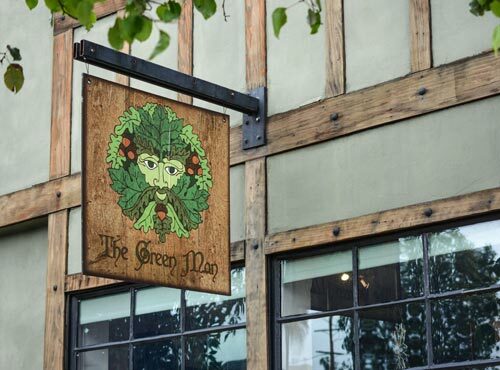 Working at the Green Man means I interact with a lot of the store spirits both within the space as well as those who walk in through the door. This time was just a little different. Normally, I equate the experience of the “talking skulls” in the case as meeting puppies. They’re excited and jumping all around trying to get your attention. With this skull, the energy was more contained and less childlike. I felt the spirit and immediately wanted to connect more. Now, I never buy things like this unless I feel a genuine need for them. So I told the skull that if it wanted to come home with me it would need to give me the money to purchase him. I don’t believe it was more than twenty minutes after that when I received a phone call from one of my students in the class I was teaching at the time. She had called because she wanted to drop off money she owed from the previous class. I hung up the phone and began to laugh because that was exactly how much money I would need to pay for the skull. So of course I bought it and talked to the spirit a bit more. At the time, all he wanted to do was watch and listen. So I set him down on a ledge in the apothecary where I normally work and allowed him to observe. This went on for a long time; any time I would ask him anything in terms of wanting to do more he would just say he was watching. I could tell he was studying me so he could best approach me when he had a better understanding. After several weeks I finally got something out of him. Griffin was teaching a class and I wanted to take it, but couldn’t because of work. So Buzz offered to take the class for me. At this point I realized his current mode was that of a recorder. So I used him as such. I put him down on the table in the classroom and he listened to everything and I was able to later learn from him the majority of the class. After that experience our relationship began to grow more. I would catch him walking with me in the apothecary when I went to make a candle or mojo bag. He was observing me work and I could tell was soon going to start giving me advice. About a month later, he asked to come along on a vision quest. Not surprisingly one to encounter our familiar spirits. This was the first time I saw him fully in the spirit realm. He was tall and cloaked and hooded with a large cauldron before him he was stirring. I immediately felt a very strong and deep connection to him and knew that he was more than just a crystal spirit. He showed me some interesting things he could do and also he expressed that he liked me. I had gotten his name at this point so it was nice to put a face to a name. After that our relationship grew and expanded into us becoming very good working partners. He would watch my back and I would his. He teaches me things as I teach him. He has now moved into a resin skull as his vessel and I am happy to call him a familiar and working partner. That’s my story; one of magic and friendship.